These are Corsair's fastest SSDs to date. Corsair has been curiously quiet in the solid state drive space as of late, but it's not from a lack of interest. 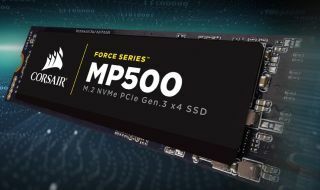 Instead, the company's been busy whipping up its fastest SSD family to date, the Force Series MP500. These new SSDs wield a Phison PS5007-E7 NVMe controller and high-bandwidth PCIe Gen. 3 x4 M.2 2280 interface. That combination results in up to 3,000MB/s sequential read and up to 2,400MB/s sequential write performance, according to Corsair's internal testing. For the sake of comparison, Samsung's 960 Pro boasts rated read and write speeds of up to 3,500MB/s and 2,100MB/s, respectively, while the 960 Evo line is rated to reach up to 3,200MB/s for reads and up to 1,800MB/s for writes. We'll have to perform our own testing to see how things truly shake out, but going by the rated metrics alone, Corsair's MP500 trails in read performance by 200MB/s to 500MB/s while offering 300MB/s to 600MB/s faster writes. Beyond raw performance, Corsair touts a high level of data integrity and reliability from a combination of its proprietary SmartECC, SmartRefresh, and SmartFlush technologies. These are designed to safeguard data from corruption during unexpected power losses and improper shutdowns. Corsair's MP500 SSDs come in three capacities, 120GB ($110), 240GB ($170), and 480GB ($325). All three are available now direct from Corsair and are backed by a 3-year warranty.